Democratic candidate for U.S. Senate Beto O'Rourke joined protesters in saying the decision should be easy. But police departments rarely move quickly on such issues. A dozen days after an unarmed black man was shot and killed in his apartment in Dallas, the white off-duty police officer who killed him remains on the job. 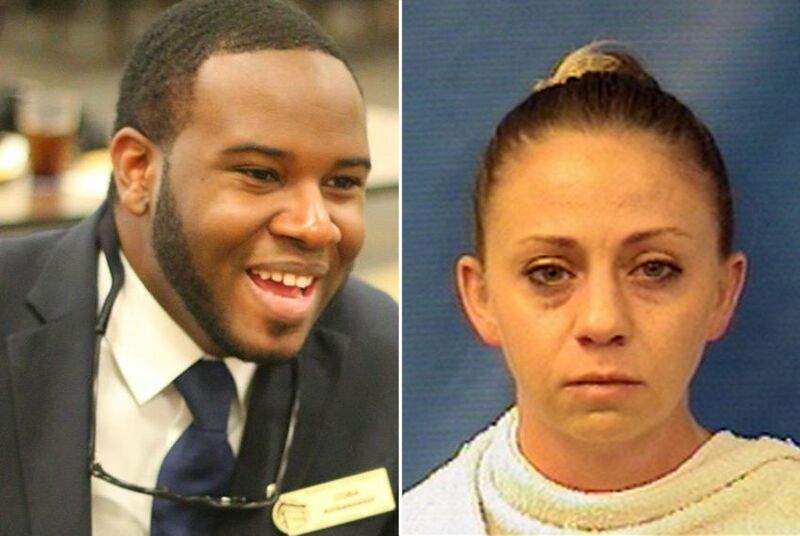 Officer Amber Guyger’s continued employment — she’s currently on paid administrative leave — has stoked the growing anger surrounding the unprecedented shooting and become a point of contention in the state’s highest-profile political campaign. At a Dallas rally Friday night, Democratic U.S. Senate candidate Beto O’Rourke suggested she should be fired. “I don't understand given the actions how anyone can come to any other conclusion,” he told KDFW-TV. Republican Sen. Ted Cruz later criticized that stance, saying he wished O’Rourke “and Democrats weren’t so quick to always blame the police officer.” He described the shooting as a tragedy and nightmare, but said we have a legal system in place to learn the facts. Though Guyger already faces a charge of manslaughter, it’s not unusual for her to still have her job at this stage of the investigation. Police departments often struggle to balance giving a fair review of an officer’s actions and ensuring accountability after a seemingly unjustified shooting or incident. While there have been cases, including some in Dallas, where officers were fired quickly after a shooting, the process usually takes time. Still, in a case where the facts that have been made public seem to clearly put the officer in the wrong, many think 12 days is too long to wait for action. Since then, protests have erupted across the city, including at the Dallas Cowboys’ first home game of the season Sunday night, where activists marched with coffins to AT&T Stadium, according to The Dallas Morning News. The Dallas Police Department did not immediately respond to a request for comment on Guyger’s status. The city’s reaction stands in stark contrast to the Balch Springs shooting death of 15-year-old Jordan Edwards last year. The officer, Roy Oliver, was fired by the smaller Dallas County department three days after the shooting and sentenced to 15 years in prison on a murder conviction last month. But Oliver’s firing, and entire case, moved fast. Often, disciplinary action takes time, if it happens at all. In El Paso, for example, off-duty police officer Jorge Gonzalez was indicted in 2011 after he shot and paralyzed a man who rear-ended him, but he continued to work for the city police department until he was fired in 2014 for unrelated reasons. In Dallas, three officers indicted on misdemeanor charges in the 2016 death of an unarmed man high on cocaine are still employed by the department, according to The Dallas Morning News. Another was fired weeks after he was indicted on an aggravated assault charge in June 2017 resulting from a fatal shooting five months earlier. The reason for the delay often stems from internal processes, potential appeals and the departmental investigation taking a backseat to the criminal investigation, according to Howard Williams, a former police chief in San Marcos and a criminal justice lecturer at Texas State University. Dallas, however, has taken relatively quick disciplinary action against officers in the past. Officers Amy Wilburn and Cardan Spencer were both fired in 2013 by former Chief David Brown within three weeks of nonfatal shootings — before their eventual criminal indictments and guilty pleas. Another officer fired in 2014 after allegedly using excessive force with a panhandler, however, was rehired after a grand jury declined to indict him, The Dallas Morning News reported. Charley Wilkison, head of the Combined Law Enforcement Associations of Texas, said he’s sure the police department is following the rules, but that doesn’t mean there won’t be action. “They don’t mind firing cops in Dallas; they do it all the time,” he said. But coming on the heels of a murder conviction for another fatal shooting of a black person, Jean’s family and attorneys are demanding results now. Disclosure: AT&T and the Texas State University System have been financial supporters of The Texas Tribune, a nonprofit, nonpartisan news organization that is funded in part by donations from members, foundations and corporate sponsors. Financial supporters play no role in the Tribune's journalism. Find a complete list of them here.